Genuine Skoda thermo-electric cool box (20l) - with car battery voltage guard. This thermoelectric cooling box with 20 litres of space will ensure snacks are at hand and at the right temperature. 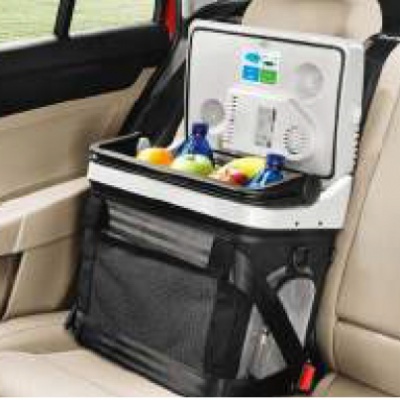 Keeps food chilled for picnics or travelling from the supermarket. Location: Back seat of the car or the luggage compartment if it is equipped with a 12V socket. If the cooling box is placed in the luggage compartment it must be secured against movements e.g. using an universal fixing element. Power supply: 12V or 220 to 240V. There are 2 power modes: ECO (the cooling box consumes less power) or MAX (the cooling box achieves the maximum cooling power). Dimensions: 420 x 300 x 420 mm.